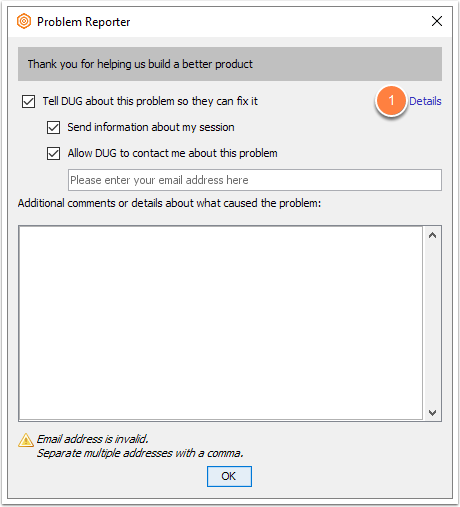 If you contact DUG support to report a problem, you may be asked to send diagnostic logs to us for further analysis. This is the easiest and fastest method to report a problem. If Insight is frozen or not responding. Let us know the issue you are facing. On rare occasions, our developers may ask for more detailed or specific timed logs. This can help to give a fuller picture of the background processes. Note: For a fatal error, see Help, Insight just crashed! What should I do now? From the Insight Control Panel, open the Help menu. 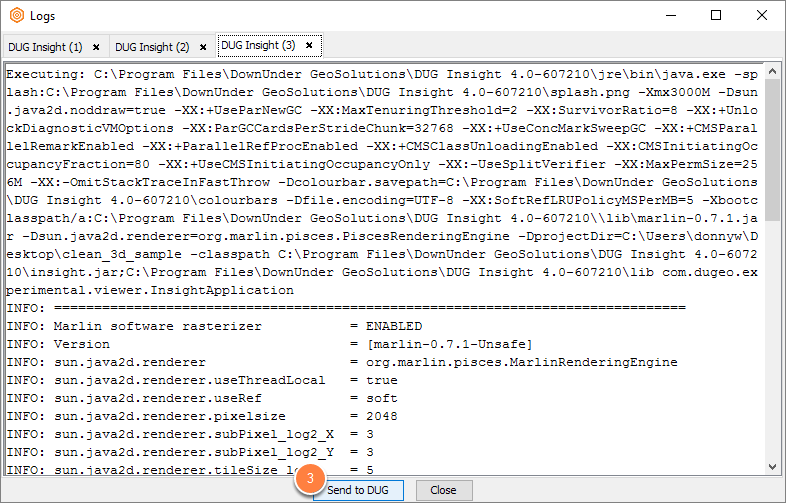 Select Send Logs to DUG. The Problem Reporter will be displayed. 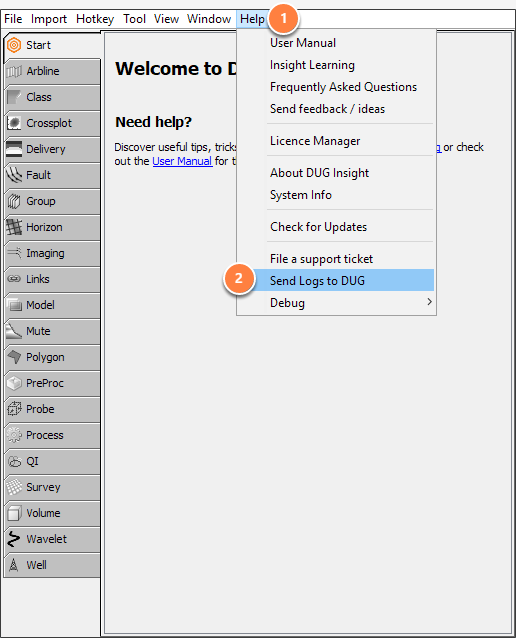 Make sure the Send information about my session check box is ticked to send the diagnostic logs to DUG. If you want a response from the support team, select the Allow DUG to contact me check box and make sure to provide a valid email address. Describe your problem in greater detail in the box below. Any additional information will go a long way in helping us diagnose your problem. Click OK to send this information to the support team for analysis. Note: It is important that you send the logs while you are having the problem. Sending it later will not be useful in providing information related to the problem. 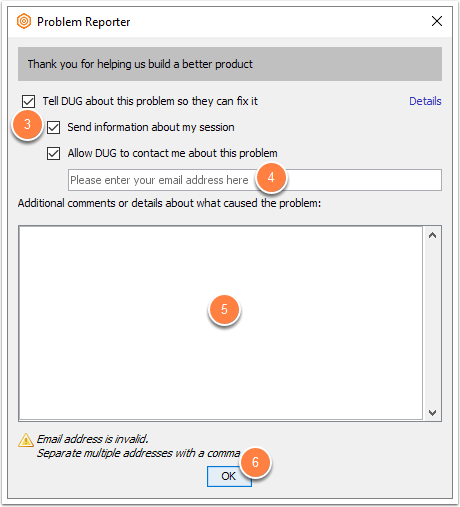 If Insight fails to launch, has frozen/hung, or is running unusually slow, users can view and send the logs via the DUG Insight Launcher. Click Logs to view the diagnostic logs. Each application and invocation of the software gets its own tab in the Logs window. Note: For more information regarding logs, click on the Help icon on the right. 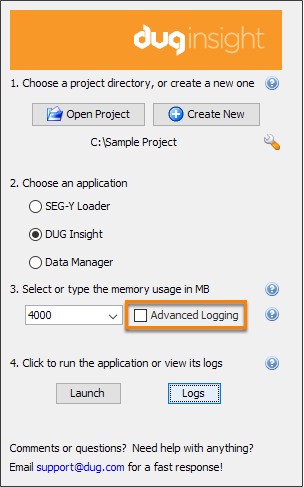 In the Logs window, select the relevant application (i.e. 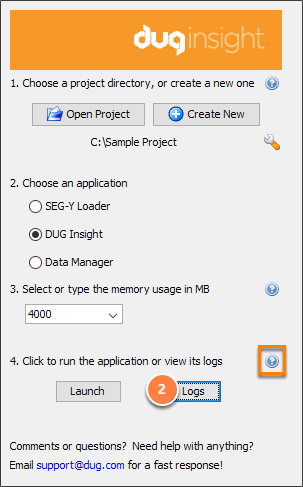 DUG Insight, SEG-Y Loader) and session, and click Send to DUG. 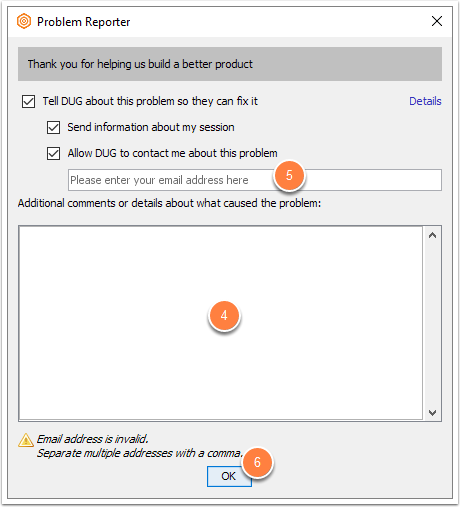 The Problem Reporter will be displayed where you can type your email address and describe the problem you are experiencing. This information, along with the contents of the log, will be sent to the support team for analysis. If you want a response from the support team, please provide an email address in the box. Click OK to send the logs. Note: It is important that you send the logs to DUG while you are having that problem. Sending it later will not be useful to provide information related to the problem. 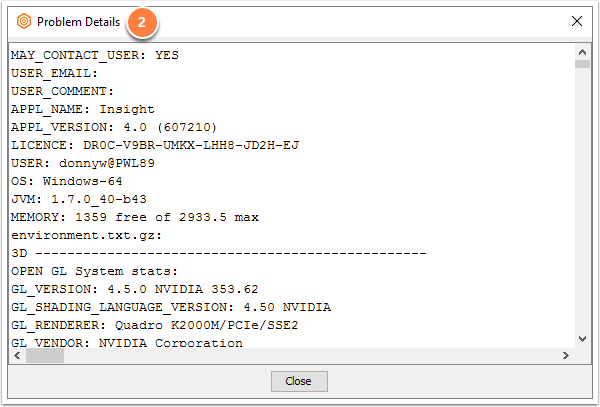 Pressing F12 in the launcher will display an Advanced Logging check box. Enabling this option will cause the application to monitor its performance, generate a performance log and send it automatically to us when the application is closed. However, having advanced logging turned on may slightly affect the performance of the application. Only select this option if you intend to diagnose specific performance issues. Once the application is started, simply leave the Launcher open. No further action is required. Once the application exits, the Launcher will automatically transmit the performance data to DUG. In the Problem Reporter window, click the small blue "Details" link on the right. A window will pop up containing the logs. Select the contents of the window (type CTRL-A). Copy the selection (type CTRL-C). Paste this information into an e-mail and send it to support@dugeo.com.